On the other hand, positive people are in tune with their inner energy sources. Their energy flows outwards, spreading goodness and warmth to people around them. It’s like a fountain of overflowing water. 😀 This is why you feel upbeat and energetic when around positive people — they have a magnetic quality that draws people in automatically. Great leaders, iconic figures and some celebrities have this quality that allows them to attract large masses of people. When I was in my previous company, there were numerous leaders in the management who exuded such qualities – it was always liberating being around them. Some of my past encounters with energy vampires have left me drained for a good part of the day. If I was dealing with a vampire king or queen, the aftereffects could spill over to the next day. There was a notable period when I was 17 or 18 when I was exposed to a huge amount of negativity. I was in Junior College then. Because the JC I went to was regarded as one of the poorer performing ones in Singapore, many students who registered with the school did so because they had no other schools to go to, rather than because they wanted to be there. Hence, many of my schoolmates were constantly negative and disgruntled. Some firmly believed that their lives were destined for failure. Even some of the teachers would enforce these failing beliefs on the students. These teachers were clearly not proud of being part of the school; some were sent to teach at here against their desires. They would sometimes draw comparisons with students in the top schools they used to teach in, lauding those students and indirectly putting us/our school down. One of my teachers in particular was very skeptical and judgmental. She constantly encouraged my class to settle for mediocrity, because trying to strive for anything else would be setting ourselves up for disappointment and failure. Of course, that was a load of bull and simply a projection of her own issues onto us, rather than a reflection of what we were capable of. If anyone had any dreams or goals, she would be quick to squash them, saying he/she was being impractical. It’s one thing to hear such negative words from your peers; it’s another thing to hear them from teachers — the very people who are supposed to guide you and support you in life. Frankly, it was quite depressing. I remember feeling very shocked the first time I heard her telling us to settle for mediocrity. After that, I began to discount whatever that teacher said. I knew that something wasn’t right, and I wasn’t going to entertain such nonsense, undermining advice from anyone even if he/she was a teacher. All in all, my JC was like a breeding ground for energy vampires. I was quite a positive person, so I would constantly try to uplift my friends. However, many times I felt like I was going up against a tidal wave. I found it hard to influence my friends with positive thinking, because many preferred to stick with their way of thought. It didn’t help that the jaded teachers would often offset my words with negative sweeping judgments about us and the school. On a side note, I remember my then-principal was a really positive and passionate man who had great visions for the school. He was actually the reason why I decided to enter that particular JC, rather than others. I really respected him for his idealism and commitment. 😀 In retrospect, he probably faced huge difficulties in leading the school toward his visions. The first important step when facing energy vampires is to ground yourself. This means centering yourself such that you do not get easily affected or swayed by negative energies around you. Otherwise you can easily get sucked into the energy vampire’s vortex, no different from being sucked into a quick sand. You need to be properly grounded before you interact with an energy vampire. To ground yourself, first imagine the essence of your soul amassing in the center of your body. Next, imagine this essence spreading throughout your body, to the point where it’s extending out through your feet, deep into the ground, in the form of thick, sturdy roots. The roots are extremely strong and they are anchoring you into the ground such that nothing can sway you. Think of yourself as a big and strong oak tree that’s firmly rooted in the ground. The next step is to shield yourself. This is your second layer of protection, after grounding. A shield is like a bubble around you that separates you from the world; it’s an energy barrier which keeps out undesirable energy from entering your space. Like a real shield, your shield is a defense tool which protects you from aggressors or bad energy. It also helps to keep your (positive) energy in and prevents it from being sucked by a vampire. Read: How to Make a Energy Shield. A shield is not permanent. The energy of the shield wears off over time, which decreases its protective ability. In the face of an energy vampire leeching your energy, the shield’s strength can deplete quickly. The more negative the vampire, the weaker the shield becomes. When your shield becomes fully depleted, it will cease to function. To avoid that from happening, re-enforce your shield once every few hours by repeating the energy shield exercise. It’s tricky to deal with an energy vampire on a one to one basis because all his/her negativity gets directed at you. On the other hand, if you are in a group of three or more, the vampire’s attention becomes divided between you and the other people. This way, you don’t have to bear the full brunt of the person’s pessimism. Another plus point of hanging out in a group is that I get to observe and learn from how others deal with the vampire, which then gives me ideas on how to handle him/her. Since everyone has different way of thinking and handling people, I always learn something new from everyone. People are usually negative because of negative incidents that happened to them in the past — bad childhood stories. Sometimes their venting comes from repressing their grievances. Rather than disregard their viewpoints, provide a listening ear. Sometimes what people need aren’t solutions, but just someone to listen to and empathize with them. By letting them air their thoughts, it may help them to realize what they should do. Is there anything you can help them with? Sometimes people complain as a way of crying for help. See if there’s anything you can do to support them. Ask them, “Is there anything I can do to help you?”. They may not show it, but deep down they’ll appreciate your emotional generosity. Some energy vampires are triggered by certain topics. For example, a friend of mine sinks into a self-victimizing mode whenever we talk about his work. No matter what I say (or don’t say), he’ll keep complaining once we talk about work. In the ideal world we want to help lift the person out of his/her negativity. But in cases where the negativity is too deeply rooted to tackle in a one-off conversation, or where the person has very staunch views on that topic, it may be better to let go and switch to a different topic to lighten the mood. Simple things like the latest movies, daily occurrences, common friends, and news stories make for light conversation. Keep the conversation to things that uplifts the person. When all else fails, the last step is to cut them away. Here are 12 signs it’s time to move on from a relationship (while this article is written in the context of romantic relationships, they also apply for friendships/other relationships), and another one on Why I Parted Ways With My Best Friend of 10 Years. While cutting the person (especially if he/she is a friend) may seem drastic, bear in mind that not everyone is going to be compatible with you in your life journey, and it’s up to you to decide who you want to be with. Ultimately, you are the average of the five people you are with. By spending precious time around energy vampires, you’ll naturally become negative too, which I’m sure isn’t what you want. Now that you have learned how to deal with negative people, think about the people you face daily. 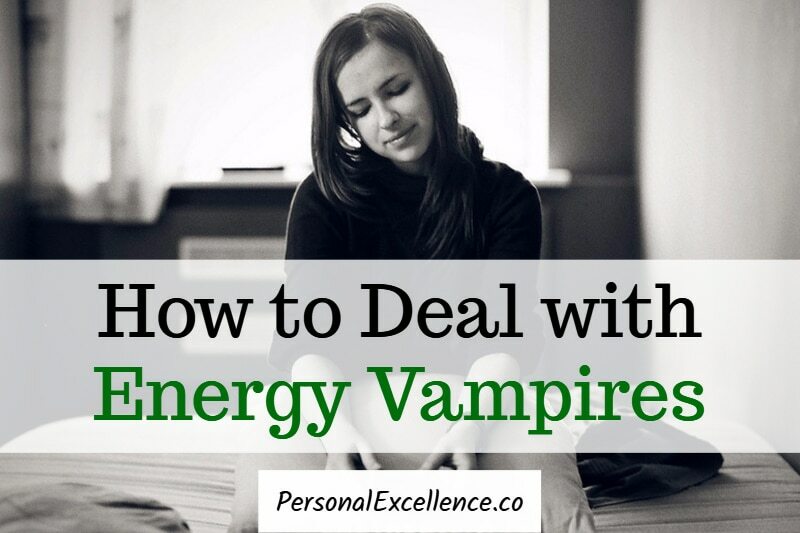 Do you face any energy vampires? Who are they? What can you do to better deal with them in the future?